The Minnesota Timberwolves added an athletic shooting guard and versatile defender with the 20th pick in the NBA Draft. 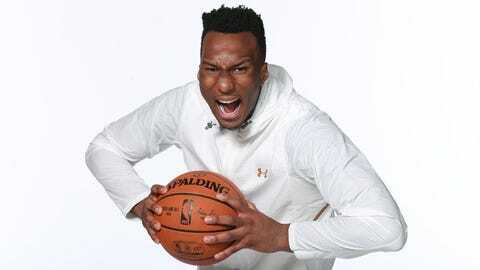 Josh Okogie joins the Wolves after spending two seasons at Georgia Tech. But while his college numbers are promising, the 6-foot-4 shooting guard has been relatively unheralded at each stage of his career. Read on to learn more about this former Yellow Jackets star. — Born in Lagos, Nigeria, Okogie grew up near Atlanta and was a relative unknown back when he was recruited by Georgia Tech out of Shiloh High School. — He entered the draft after a terrific sophomore season. He averaged 18.2 points, 6.3 rebounds and 2.5 assists per game. — A solid shooter, Okogie averaged 38.2 percent from 3-point range in college, averaging 4.2 attempts per game as a sophomore. — Okogie’s seven-foot wingspan makes him a versatile and disruptive defender. He ranked second in the Atlantic Coast Conference last season with 1.8 steals per game. — He got to the line often too. Okogie averaged 6.8 free throw attempts per game last season, third in the ACC. — When asked to compare himself to a current NBA player, Okogie selected Wolves star Jimmy Butler. Okogie noted that, like Butler, he takes pride in his defensive abilities. — However, he wasn’t necessarily expected to go pro. Okogie indicated after the ACC tournament in March that he planned to return to Georgia Tech for his junior season. What a difference a few months can make. — A headline-grabbing performance at the combine changed things. He tied Milwaukee Bucks pick Donte DiVincenzo for the best vertical lead of the combine at 42 inches and had the fastest three-quarter court sprint at 3.04 seconds. Okogie also finished fifth in the shuttle run at 3.03 seconds. — Ultimately, Okogie became the 19th first-round pick in Georgia Tech’s history, and the program’s first since Iman Shumpert went 17th overall to the New York Knicks in 2011.